Hey, hey, it’s Recipe ReDux day! And happy Saturday at that too 🙂 Are you making weekend pancakes or waffles? I know I am, haha! But I don’t want to delay you with falling into my love of breakfast when there are most pressing matters at hand. When ever the new month rolls around and the new theme is posted for the ReDux members to see, I always get super excited. Then I usually read the theme and my excitement dwindles. I usually have no idea what I will make and that freaks me out. But then over the next few weeks I do major recipe development all in my head, playing around and tossing ideas this way and that. Finally I come up with something I hope will be spectacular. I then pick a weekend, gather my ingredients, and just wing it. Well once I got the idea for this month’s theme I was really excited. Not only that, but I used one of my favorite foods. Can you guess what it is? That is right, the PSP! Since I was able to buy a massive haul of them the other week, I had tons and what better way to be creative and utilize a PSP in a new way than to use it in my ReDux. March’s theme: A Play on Patties: While St. Patty’s Day will be over by the time The Recipe ReDux rolls around this month, we’re celebrating the ‘patty’ all month long. We’ve seen images of stacked patties go crazy on food photo sharing sites like HealthyAperture.com; so stack ‘em up! Think healthy tuna burgers, potato patties, or veggie stacks. Ah, patties, burgers, and round fun treats. I love veggie burgers and even my most recent grilled portobello burger. So a new bean/veggie/potato patty it was! 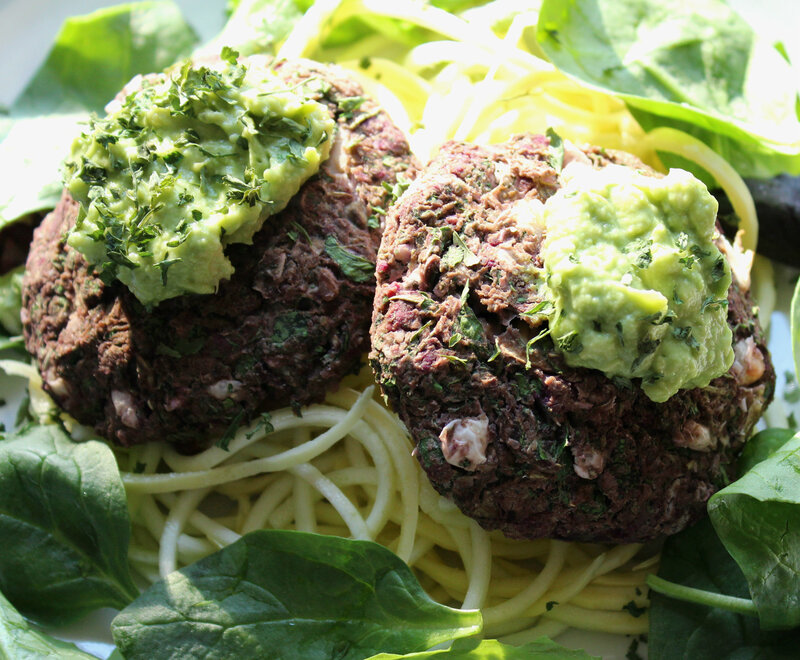 These vegan and gluten-free patties are elegant with a beautiful purple color pop. The aroma and taste of the rosemary brings them over the top. Simple baked in the oven for a healthy and delicious dinnertime meal. + Preheat the oven to 415°F. + In a high powdered blender, add all of the patty ingredients. Then simply pulse and blend until you get a mostly smooth, but still “chunky” and with texture patty “dough”. You may need to stop and scrap the sides a few times. Once I thought mine was done I scooped it all out into a bowl and just did a final mix with my hands. + Then on a parchment paper lined baking sheet, form 6 medium sized patties and place them down. Then bake in the oven for 20 minutes. 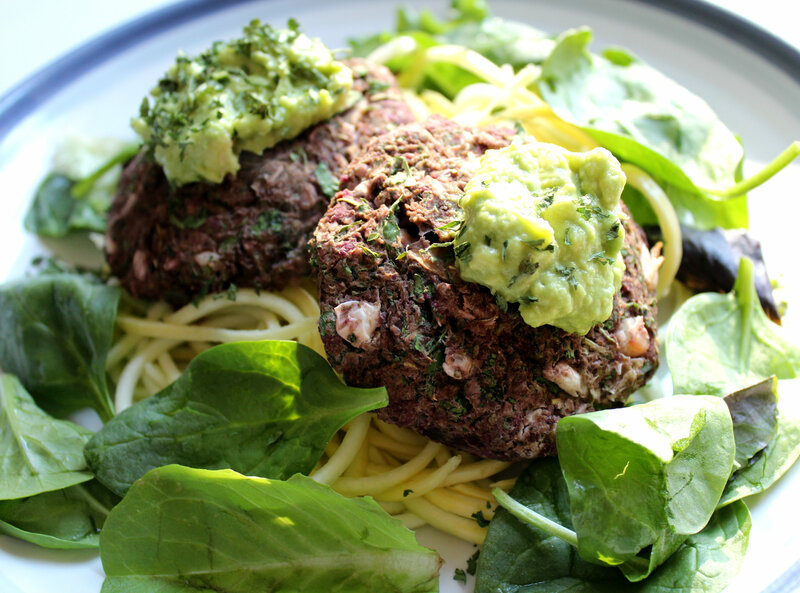 + While they are baking you can spiralize, wash your greens, and mash your ‘cado! + When done, take them out and serve! 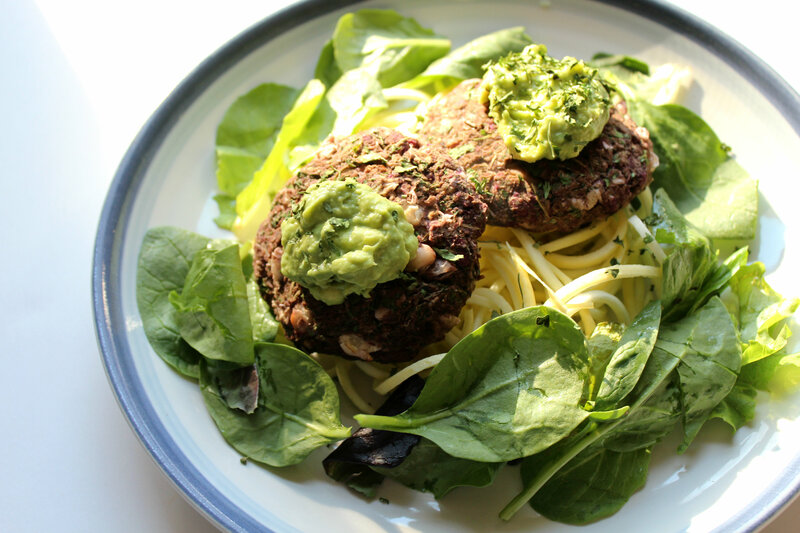 To make a pretty presentation, plate some spiralized squash first, then two patties, place some greens around the plate, and top each patty with a dollop of avocado and a sprinkling of parsley! PSPs never cease to amaze me 😉 Make sure you check out all the other ReDux members recipes in the link-up below! 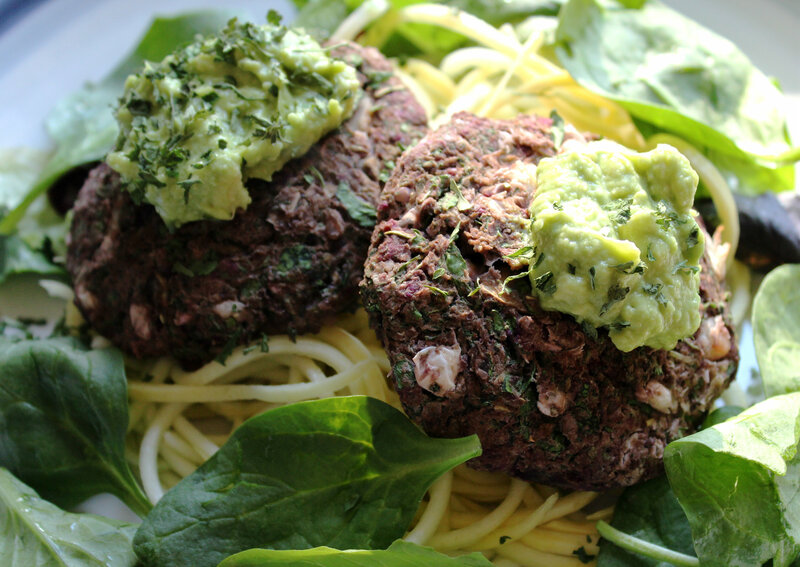 What is your favorite veggie burger recipe? Do you make your own or do you but pre-made burgers at the store? I implore you to make your own! It is so easy. Just make a huge batch and freeze them. After you blend all your ingredients you can simple freeze them on a pan and then once frozen wrap each one individually in wax paper and then place each in a single plastic baggie. Or you can actually bake them, let them cool, and freeze them the same way! When you want one, just take it out a few hours before and either bake for the full time if uncooked, or heat them up in a toaster oven.